The conflict in the Central African Republic (CAR) appears to have no end in sight, and the country is sinking into a structural crisis. Despite the more than $3.2 billion spent by the United Nations on peacekeeping since 2014, entire communities continue to be regularly targeted in carefully orchestrated military operations by armed groups. Not only have the various mediation initiatives failed to obtain a political compromise sufficient to manage the simple respect of a ceasefire, worse yet, the perpetrators of atrocities are recognized by regional and international actors as legitimate political interlocutors with whom dialogue is necessary and peace must be negotiated. 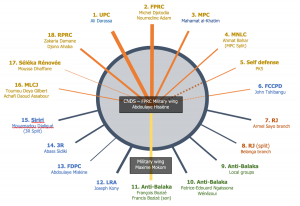 A new report by the Enough Project’s Nathalia Dukhan maps the myriad war profiteering armed groups in CAR, exploring their shifting alliances and competing interests. In this report, Dukhan also argues that a new approach to peace is needed, one that ends the incentives for violence and also encourages accountability and creates leverage for more sustainable peace processes. The report provides an updated version of the graphic mapping armed groups that was initially published in August 2017. The report’s graphic is complemented by a map and a brief that analyzes the political factors driving political and military alliances between armed groups, particularly in the context of internationalization of the CAR armed conflict.